Like reconstitution, which was tried three years ago at seven high schools, intervention provides for the expedited removal of staff found wanting. However, this time, the board is sending in teams of veteran teachers in various subject areas to work with their colleagues in the intervention schools first. By law, teachers and other staffers have a year to demonstrate their ability. Under reconstitution, they were judged on the basis of brief interviews. 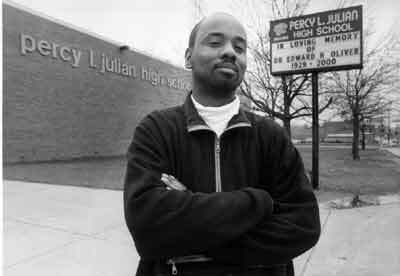 Julian High School in Washington Heights is the only Chicago public school where no parents signed up to run for the local school council. When the Board of Education announced in July that five high schools would undergo intervention, one date became fixed in teachers’ minds: April 13. By that date, principals are to have completed five mandatory evaluations of each tenured teacher in the intervention schools and decided who stays and who goes. The new policy, intended to ensure students would no longer languish in the program, has since produced results. More students are exiting the program after three or four years, and fewer are enrolled in the program overall. School officials say these students are doing well in their all-English classes. The board tracked some 3,524 3rd -through 8th-graders who exited the bilingual program between 1998 and 2000, and found that at every grade they scored above the CPS median on the Iowa Test of Basic Skills (ITBS). The Jacqueline B. Vaughn Graduate School for Teacher Leadership, named for the union’s late, feisty president, is slated to open next January, enrolling 225 teachers. The Vaughn graduate school will offer a two-year course of study that leads to a masters’ degree in teacher leadership. The only similar program run locally is at St. Xavier University. Deborah Lynch, president of the Chicago Teachers Union, says this year the union is encouraging teachers to run for council seats but that it is rethinking its stance on councils, with an eye to boosting teacher leadership in schools. A CTU poll of 5,000 teachers last fall found that nearly half of those surveyed were dissatisfied with their schools’ councils. Low candidate sign-ups, though, are not unusual and the board has extended deadlines in the last two elections. The number of people running for LSCs has declined each election since the first one in 1989, when 17,256 candidates ran. When elections were last held two years ago, 7,095 people ran, roughly the same ran as in 1998. The board voted Jan. 23 to offer a two-year renewal to Academy of Communication and Technology (ACT) in Garfield Park to further monitor the school’s uneven performance on standardized tests. The extension requires ACT to meet certain academic goals by 2004, which if met, will allow the school to remain open. Meanwhile, school officials are considering closing Nuestra America Charter in West Humboldt Park, says Greg Richmond, who oversees CPS charter schools. A history of low test scores and leadership squabbles has created an uncertain future for the school. Contracts for principals at 175 elementary and high schools are set to expire next June, and councils must notify them by Feb. 1 whether they will be offered a renewal or be replaced. Under state law, LSCs must complete a state-mandated evaluation process before they deliberate and announce their decision. The evaluation is based on several criteria, including instructional leadership, improvement on academic performance and communication with parents and staff. 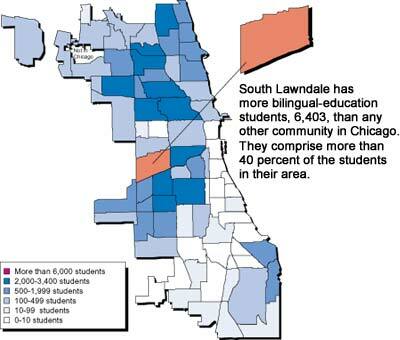 This scene is a daily reality for high school students enrolled in two CPS International Newcomer and Refugee Centers. Newcomer centers were created to provide a soft landing to students who are at least 14 years old and have been living in the U.S. for less than a year. The first one was opened at Taft High School in 1999; a second opened at Senn High School a year later. This fall, each school has 40 students enrolled.